A Weekly Journal Devoted to the Science, History, Philosophy and Teachings of Spiritualism / A Monthly, Scientific Record of Important Current Events Connected with Modern Spiritualism, Together with Original and Selected Articles on its Philosophy. Boston, MA. Publisher: Scientist Publishing Co.. Editor: E. Gerry Brown. 1/1, September 10, 1874-7/6, July 1878. 8 1/2 x 13. 12 pp., $2.00 a year as a weekly (until June 21, 1877), 36 pp., $1.50 a year as a monthly. Brown discontinued the journal in June 1877, pleading the need for a rest (he occasionally set the type himself) and urging his friends to raise a fund for the journal,. The journal was revived from January to July 1878 as a monthly with a decidedly more "occult" tone. Brown then formally declared bankruptcy, leaving liabilities of $3,000 and assets of only $120. 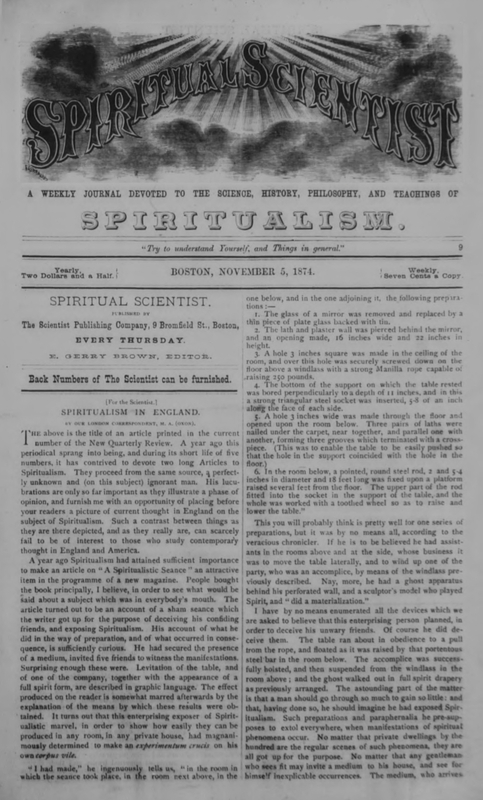 The journal initially positioned itself as the counterweight to the Banner of Light, also published in Boston, and opposed the older journal’s silence in the face of the free-love/social-freedom trends of the time and its reluctance to address the waves of fraudulent mediums and their exposures that were practically universal at the time. Its importance comes from the fact that H.P. Blavatsky and H.S. Olcott for a time took the journal under their protection (even lending Brown money--a debt wiped out in his bankruptcy) and used it to announce the revolution effected in spiritualism by occultism, and the coming of the Brotherhood of Luxor and, to a lesser extent, Theosophy. It would not be unfair to conclude that the journal was the first devoted to occultism in the modern acceptance of the term. Boston Athenaeum Library; Boston Public Library, microfilm.